Mike Stroud was educated at Trinity School of John Whitgift in the London Borough of Croydon. He obtained a degree in anthropology and genetics, before qualifying as a doctor in 1979. Between 1979 and 1989 he worked in a variety of hospital posts interspersed with far reaching expeditions and travel. In 1990, Mike Stroud entered into full time research on endurance, nutrition and survival under extreme conditions, working at both the RAF Institute of Aviation Medicine and the Army Personnel Research Establishment. He later became the Chief Scientist at the UK Centre for Human Sciences. 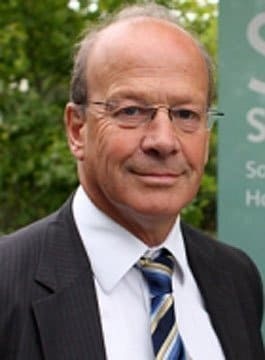 In 1995, he returned to hospital medicine and university work and in 1998 was appointed as a Senior Lecturer in Medicine and Nutrition, and Consultant Gastroenterologist at Southampton. In the expedition and sporting world, Mike Stroud is best known for his 1986 attempt with Sir Ranulph Fiennes to make the first unsupported journey on foot to the North Pole from Arctic Canada which was then followed by four more North Pole Attempts from both Canada and Siberia. These included a record-breaking journey in 1990, which raised more than £2 million for charity. Following these Arctic ventures, Mike Stroud and Sir Ranulph Fiennes switched attention to Antarctica and the South Pole where in 1992/3 they broke several records when completing the first unaided walk across the continent. At the time, it was also the longest unsupported walk in history. On his return from the South Pole, Mike Stroud was awarded the OBE for ‘Human Endeavour and Services to Charity’ and the Polar Medal for ‘Services to Arctic and Antarctic Exploration’. The journey had raised a further £2 million for good causes. Following the 1993 Polar journey, Mike Stroud continued his interest in extreme sports, leading the first UK team in the 1994 Marathon of the Sands, (a trans-Sahara multi-marathon). In 1995 and ’96 he competed in the first two ultra-distance Eco-Challenge adventure races and in April 2002, he completed the first unsupported, non-stop desert crossing of Qatar, covering the 200 km in just 3 days. In November 2003, Stroud and Sir Ranulph completed seven full marathons, on seven continents in just seven days, once again raising huge amounts for money for charity. Mike Stroud is the author of two books, Shadows on The Wasteland – documenting his crossing of Antarctica and Survival of The Fittest – examining the relationship between nutrition, exercise, health and peak performance. As a leading authority of survival, nutrition and endurance Mike appears frequently on TV and radio. He was the endurance and medical expert on all three series of BBC TV’s, Are You Tough Enough for the SAS. He is also presenter and endurance expert on BBC’s, The Challenge.